City sees opportunity to attract one or more new retailers. When a Walmart Neighborhood Market opened in Bell Gardens in 2012, a marching band led the grand opening ceremony. Local residents and city officials welcomed the retailer with open arms. On Tuesday, just days following the company’s announcement that it would close 7 stores by the end of the month in Southern California, including the Bell Gardens store, loyal customers said they are not ready to say goodbye. Walmart is closing 269 locations globally as part of a company-wide restructuring. In addition to Bell Gardens, local closures include stores in Long Beach, Altadena, Carson, Hawaiian Gardens, San Bernardino and Baldwin Hills and Chinatown, which closed Sunday. The Bell Gardens Walmart location at the Los Jardines Shopping Center in the 6800 block of Eastern Avenue will close Jan. 28. According to Walmart, most of the 90 part-time and full-time employees from the Bell Gardens store will be reassigned to a nearby location. Wal-Mart spokesperson Delia Garcia told EGP that there are four stores within 6 miles and Bell Gardens employees will receive preferential hiring at those locations. News of the impending closure came as a surprise to Bell Gardens Community Development Director Abel Avalos who told EGP the city was not given any advanced notice. “It wasn’t as if the store was underperforming,” Avalos said. He emphasized that Walmart generated $35,000 in sales tax revenue annually for the city, calling the amount impressive given that most grocery items are not taxable. “In no way should this reflect that this community could not support that store,” he stressed. On Tuesday, lines at the store were long and shopping carts full as residents took advantage of the 25 percent closeout discounts being offered. “They really had good prices and good people,” lamented Bell Gardens resident Rosa Alvarez, telling EGP she shopped there twice a week. Garcia would not disclose finances for any individual store, but told EGP the Bell Gardens location had undergone the same scrutiny as all the other stores. 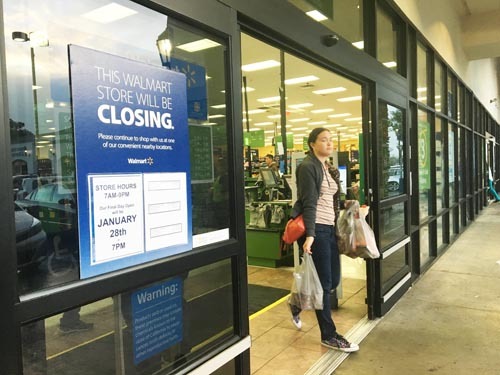 Closing stores is commonplace in the retail industry, she said, adding that Walmart has closed fewer stores than many of its competitors in recent years. There’s a potential bright side to the situation for the city, Avalos told EGP. When the Neighborhood Market opened three years ago the newly opened Bicycle Casino hotel was not a reality, he said. “We can see this as an opportunity to reach out to [higher tax generating] retailers” who could see the advantages of being located so close to the hotel, Avalos said. City staff has already reached out to Primestor – the property owner – to begin the process of looking for a business to take over the 30,000 square-foot site. The location is comparable in size to the Ross and Marshalls stores located across the street from the shopping center. Both stores produce substantial sales tax revenue for the city; the Bicycle Casino is the city’s top sales tax generator. Avalos noted the potential for possibly splitting the space to allow apparel companies and large chain restaurants like Home Town Buffet or Golden Corral to share the site. “It comes down to finding a retailer that will fill the space and be a complimentary use,” he said. Residents, however, point out that Walmart’s closing will reduce the number of grocery stores in the city down to two. “I may just drive to another Walmart outside the city to get groceries,” said Alvarez in Spanish. Bell Gardens Mayor Jennifer Rodriguez acknowledged that at just 2.5 square miles in size, the city doesn’t have the large plots of land big box retailers want, but proudly pointed out the number of national brand stores that can be found in the small blue-collar city. She does not expect the city to have trouble filling the vacancy. It’s a shame to see it go, but it won’t be missed. Not when there’s potential to fill the space with Smart N Final or Superior. If the parking situation were addressed, there’s no reason to believe that the community couldn’t support a JC Penny, lofty as it may seem. It’s almost certain that the clientele that stays at the new Bicycle Casino Hotel would appreciate it.